Attractions/Considerations : The trail offers excellent views of the Eagle river drainage to the north and the Arkansas River drainage to the south. From the top of the trail, three prominent fourteen thousand foot peaks can be seen, Mt. of the Holy Cross, Mt. Massive, and Mt. Elbert - the second highest peak in the forty-eight contiguous states. Access from Vail : Travel west on I-70 to Exit 171 for Minturn, Leadville, and Hwy 24. Exit here and turn right (south) onto Hwy 24. Proceed south about 23 miles to the Cooper Hill Ski Area on the left at Tennessee Pass. 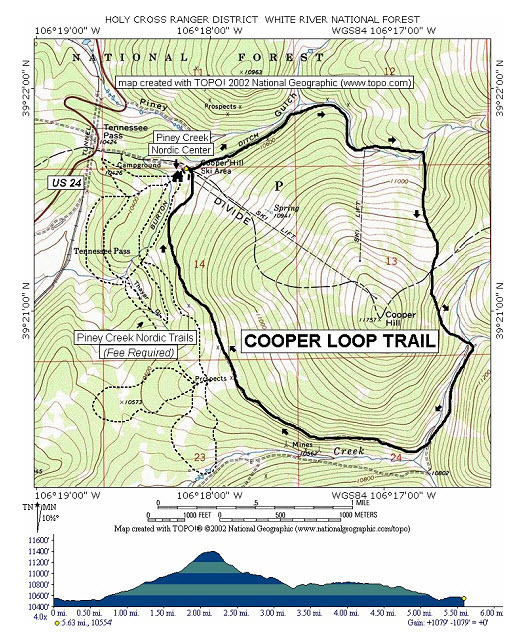 Trail Highlights : Beginning at Cooper Hill Ski Area, the first mile follows a road along a ditch to a ski lift and outhouse. From mile 1 to mile 2 the trail follows a creek and then travels uphill along the ski runs to the Continental Divide. At mile 2.5 the trail goes downhill along another small creek to a public use tent. The trail then proceeds along a 4-wheel drive road that is narrow and steep in some places. At mile 3.3 watch for a junction and take the right fork. The trail continues for 2.3 more miles along the 4-wheel drive road back to the ski area. This trail requires uphill climbing and skiing down narrow roads. For this reason it is rated more difficult.